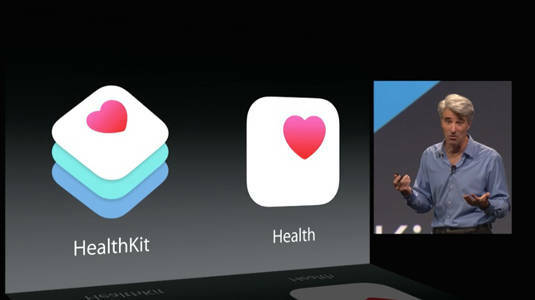 HealthKit and HomeKit APIs – prepping developers in advance of the iWatch? WWDC Apple's iOS 8, introduced on Monday and due to reach the masses this fall, has a raft of upgrades, but perhaps two of the most interesting items announced at the company's developers shindig are APIs that involve monitoring your vital signs and controlling your home. The bodily-functions effort is enabled by new HealthKit APIs and a corresponding iOS app called – naturally enough – Health. As Apple SVP for software engineering Craig Federighi explained in his keynote presentation, there's no shortage of emerging "Internet of Things" devices that measure various and sundry aspects of your physical state and activities, from pedometers to heart-rate monitors to bathroom scales, and that keep an eye on chronic medical conditions such as diabetes and high blood pressure. "But up to now," Federighi said, "the information gathered by those applications lives in silos – you can't get a single comprehensive picture of your health situation." HealthKit aims to end that siloification [Siloization? Siloifaction?—Ed.] by creating a single repository to which apps can contribute their data, and which either the Health app will then display, or which third-party apps can draw upon. About those third-party apps, Federighi said that HealthKit is designed to protect your privacy from prying eyes – or prying apps, for that matter. "You have total control over which applications have access to which part of your healthcare information," he promised. Apple is also working with the Mayo Clinic – "innovators in healthcare," as Federighi called them – to incorporate HealthKit into doctor-patient relationships. The Mayo Clinic is developing an app that contains a patient's personalized healthcare parameters so that, for example, if the user checks his or her blood pressure and it's out of the doctor-determined bounds, the app will contact the hospital and notify the patient's doctor so that the doc can get in touch with the patient for timely personal care. Federighi did not mention, however, if notifying a patient's insurance company is going to be part of the deal. Just as all the healthcare "Internet of Things" things currently don't have an API through which they can communicate, the same is true of such emerging devices as "smart" lights, garage door openers, thermostats, door locks, security cameras, and the like. Many of these devices have their own apps, their own protocols, and their own security mechanisms. "We thought we could bring some rationality to this space," said Federighi. Working with such home-automation companies as iHome, Schlage, Honeywell, Haier, and others, Apple came up with HomeKit APIs, "with a common network protocol that has secured pairing to ensure that only your iPhone can open your garage door or unlock your door." The HomeKit system can control individual devices, but it also enables you to create what Federighi called "scenes" – grouped actions that can accomplish a set of commands with one prompt. "With Siri integration," he said, "you can say something like 'Get ready for bed', and be assured that your garage door is closed, your door is locked, the thermostat is lowered, and your lights are dimmed." 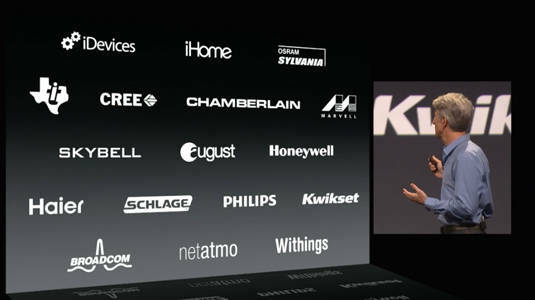 Although Federighi used an iPhone as his example device when discussing both HealthKit and HomeKit, we certainly wouldn't be surprised if the ever-elusive iWatch were to interact with those two APIs when – if? – it makes its appearance. After all, it has been rumored to have both healthy and homey capabilities.